Germany's Angela Merkel has praised Algeria for its "constructive cooperation" in repatriating rejected asylum-seekers. Merkel's Algeria visit comes ahead of an EU leaders' summit, where migration is certain to dominate. German Chancellor Angela Merkel welcomed Algeria's commitment to repatriating rejected asylum-seekers during her visit to Algiers on Monday. 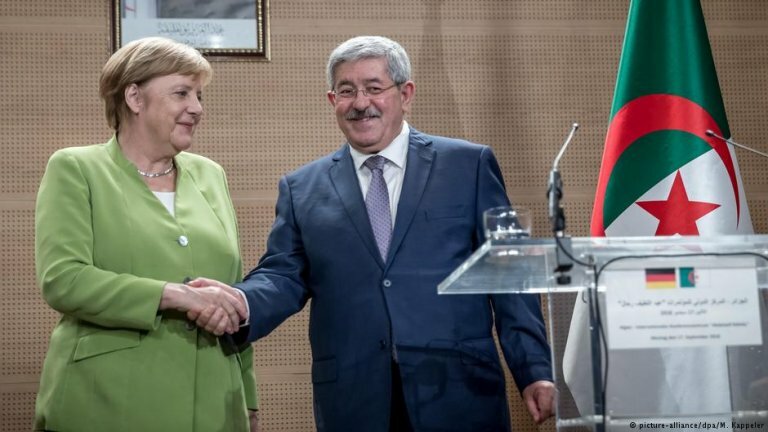 Merkel highlighted the "very constructive cooperation" between German and Algerian authorities during talks with her counterpart, Prime Minister Ahmed Ouyahia. "We talked about how to make the process more efficient, so that those who have no right to stay will be returned," she added. At the same, however, the German chancellor also said there should more opportunities for young Algerians to migrate to Germany legally, such as through a student visa program. "Both sides belong together," Merkel said. The chancellor also highlighted Algeria's role in resolving conflicts afflicting the northern African region, praising the country's commitment to resolving the civil war in Mali and being privy to diplomatic discussions on Libya's future. Algeria would strive to deal with the roughly 3,700 Algerians illegally residing in Germany, Ouyahia told reporters in Algiers, provided German officials could prove the rejected applicants are indeed Algerian. "Algeria is taking back its children. We would even be prepared to take back 5,000," the prime minister added. On Monday, Germany's Rheinische Post newspaper reported that the number of deportations from Germany to Algeria had increased significantly in recent years. Citing figures from the Federal Interior Ministry, the newspaper said that while Germany only deported 57 people back to Algeria in 2015, that figure had jumped to 504 just two years later. That trend is set to continue in 2018; some 350 Algerians had already been repatriated by July. The German government has sought to reclassify Algeria's status as a safe country of origin, along with the other Maghreb states of Morocco and Tunisia. Such a move would make it easier to repatriate rejected asylum-seekers from there. For a country to be deemed safe, the ratio of politically persecuted asylum-seekers has to be at least 5 percent of the total number of arrivals. Last year, fewer than 2 percent of Algerian asylum applicants received protected status in Germany. Monday's talks in Algiers came just days before Merkel joins her European counterparts at an EU leaders' summit Salzburg, where migration policy is certain to be among the key points of focus. Just last month, the German chancellor visited Ghana, Senegal and Nigeria to discuss ways of dissuading Africans from seeking to travel to Europe illegally.